DPx GEAR Inc. Hostile Environment Survival Tool? The DPx H?E?S?T or Hostile Environment Survival Tool? is the knife that started it all...the original, brutal-use everyday carry fixed survival blade. Made in America, used worldwide. DPx is now returning the knife to its original manufacturer, Shon Rowen and Micro Tool. The DPx H?E?S?T Original changed the way professionals think of a survival blade. It had to be to be useful and it couldn?t fail when deployed. 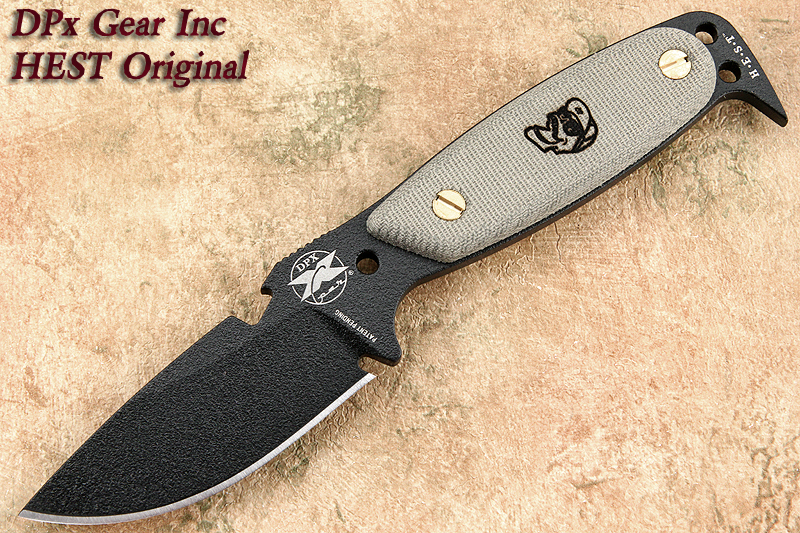 The H?E?S?T concept was created by adventurer and DPx Gear founder Robert Young Pelton who applied his time in three dozen conflicts and adventures through more than 120 countries to come up with the perfect balance of concealability, utility and fail-safe operation in an innovative blade. The H?E?S?T features a 0.19? (5mm) blade crafted from high carbon 1095 spring steel with the famous Rowen heat treatment that results in a 57-58 Rockwell hardness. You will find every aspect of the H?E?S?T Original thought out: the balance, lashing points, thumb control, wire breaker and even the ability to remove the hollow, Micarta? handles for use as a neck knife or field expedient tool. The H?E?S?T comes with a KYDEX? sheath, paracord and cord lock, MOLLE lock kit, and handle removal washer.